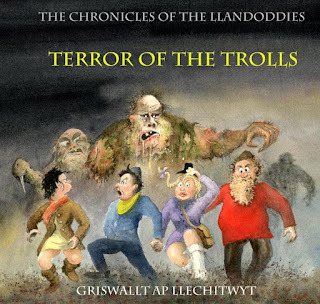 This week sees the launch of my latest book, Terror of the Trolls, the second book in the Llandoddie series based in the spa town of Llandrindod Wells in Mid Wales. As in the first volume, this one is peppered with chaos, mad-cap humour and dire peril in the form of a band of disgusting trolls who think nothing of eating the smaller Doddies for breakfast. Or afternoon tea. Little Rhiannon is kidnapped by the trolls, and is whisked away into the sinister dark depths of the Pwll-du mine. A crack Doddie rescue team is sent in, equipped with the latest weaponry produced by Professor Megawattie, such as his exploding hedgehog. “It’s perfectly safe,” he boasts, but is it? All the main characters from the first book, The Grog Invasion, are back, with Big Dewi in splendid form as the anti-hero, making a pig’s ear of just about everything. Written for children from 9 to 99, the book has 27 illustrations, mainly in colour, 128 pages, is written under my pseudonym, and copies signed by old Griswallt are available from my shop – it makes a suitably terrifying Christmas present.